“Man on the Run” is set in Ithaca, New York, and tells the story of two old ladies, and their long-lost niece, who is running away from an abusive boyfriend. The story which harkens back to an event in the author’s father’s boyhood, shows how, even after a lifetime of fear, a person can be surprised by her own courage. “Man on the Run” first appeared in The New England Review, and now has just been published in The Best Mystery Stories 2012, a must-read collection, edited by the best-selling novelist Robert Crais, author of the Elvis Cole/Joe Pike novels. Kathleen Ford has published in Yankee, Redbook, Ladies’ Home Journal, and in Southern Review, Virginia Quarterly, Antioch, North American Review, New England Review, Sewanee Review and elsewhere. Two of her stories have won PEN awards for Syndicated Fiction. She has written a novel titled Jeffrey County. Kathleen lives in Charlottesville, and is currently writing stories about the Irish soldiers in World War I, and is completing a novel about the Great War. From the good folks at JMRL: Do you love to write poetry? The Jefferson-Madison Regional Library will hold its annual teen poetry contest from October 1 to October 27. Contest forms and guidelines are available at each branch library and online at www.jmrl.org/teens. Teens ages 12 to 18 can submit only one poem they have written. Three winners will be chosen, prizes will be awarded, and the winners will be eligible for entry in the annual teen poetry contest sponsored by the Voice of Youth Advocates (VOYA) library journal. Children’s author Cathy May will be one of several judges. Submission deadline is October 27. Winners will be notified by mid-November. On Sunday, October 14, 2012, from 2:00pm to 5:00pm, Glass House Winery will host the third annual Words & Wine, a fundraiser for WriterHouse. Admission of $30 per person includes wine tasting, complimentary wine glass, light hors d’oeuvres, and one raffle ticket for a chance to win prizes generously donated by individuals and businesses! In addition, Glass House has generously agreed to donate 10% of bottle sales* during the event to WriterHouse. And, see the list of many other sponsors (coming soon). Purchase event tickets and raffle tickets at WriterHouse during open hours (after August 3), mail a check to PO Box 222, Charlottesville, 22902 or online now via PayPal below. Tickets purchased by mail or PayPal will be held for you at the event. Please make sure we have your email address so we can confirm your purchase. Can’t attend the event? Purchase raffle tickets for a chance to win one of four huge prize baskets and three vacation destinations: France, Santa Fe, and Vermont. via Words & Wine 2012 Tickets Now Available. 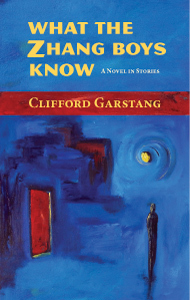 Cliff Garstang will be reading from WHAT THE ZHANG BOYS KNOW, his new novel in stories, on Thursday, October 4, at 5:30 pm at New Dominion Bookshop on the mall in Charlottesville. The book is set in Washington DC and traces the intersecting lives of the residents of Nanking Mansion, a condo building on the edge of DC’s Chinatown. The book focuses on the Zhang family as they cope with the tragic death of Maddie, mother of the Zhang Boys, but the reader also meets all the Zhangs’ diverse neighbors. » Monday, August 13, 7pm, Summer Workshop Reading offers a lively and diverse evening of creative non-fiction, fiction and poetry. Light refreshments will be served. Readers are: Jacqui Lazo, Stephanie Morris, Cora Schenberg, Sigrid Mirabella, Rachel Quinby, Elizabeth Derby, Amber Marley Padilla, Ron Harris, Gary Hoffman, Saffron Hall and Lindsay Dorrier. » Thursday, August 16, 7pm, Write What You Don’t Know: A Literary Salon with Kristen-Paige Madonia. Join us as she discusses, with WriterHouse member Jay Varner, the inspirational seeds of her new novel, Fingerprints of You, the tools she used to create her fictional world, and the challenges and benefits of going against the grain. Q&A and book signing will follow. » Tuesday, August 28, 7pm, Writing Your Way Without Agony with Don Fry. Most writers only know one way to write: the way they were taught. The author of 18 books, Don helps writers create their own writing process by strengthening their strengths and changing or avoiding their weaknesses. For more information, see the website. Red Sammy is Baltimore singer/songwriter, Adam Trice. The band name is a reference to Flannery O’Connor’s short story, “A Good Man is Hard to Find,” (1955). Trice describes the music as “graveyard country,” a style that embraces the beauty in imperfection. Life, work, hard work, disappointment, love and loss are all themes entwined in his songs. Music and arrangements are provided by Red Sammy’s ensemble, The Electric-Wire Blackbirds: John “Chesapeake” Decker (resonator guitar), Greg Humphreys (bass, electric guitar, mandolin), and Tony Calato (drums). *Original edgy rock music all night with poems incorporated throughout the show. Join poets and WriterHouse instructors Roselyn Elliott (Animals Usher Us to Grace) and Kristen Staby Rembold (Leaf and Tendril) for a reading and discussion of their recently published chapbooks, both of which draw on images from nature to explore a spectrum of experiences and emotions. Elliott and Rembold will share excerpts from their work and then discuss the creative process of making smaller books of poetry that revolve around a theme. Brief selections of wondrous and imaginative works from the monthly SFF group at WriterHouse. Brief selections of fiction, essay, and poetry will be presented by writers who have taken classes during the summer session. Free and open to the public. Refreshments will be served. Learn to write compelling and engaging travel narratives (personal essays, articles or memoir pieces) which combine the eye of a journalist with the flair of a story teller. There will be in-class readings (Theroux, Chatwin, Iyer, etc.) and exercises that address pertinent craft issues, and we will explore the essential elements of travel writing, such as sensory imagery, distinctive voice, dramatic arc, scene development, character sketches, and concrete detail. We will also discuss the practical matters of how to submit stories for publication. Sound in Poetry investigates how audible breath and the turn of the tongue through assonance and consonance, rhythmic repetition, and other sound devices delights ear and creates meaning. We’ll read poems with subtle and obvious sonic sensibility and learn how vibration resonates the body, heart, and mind. Attend to amplify the ear power of poetry and to tune into the sound of your own voice. Dip your stinky toe into the art of writing comic sketches! Whether you’re a writer wanting to explore a new medium or a fan of comedy wanting to know how sketch shows operate, this one-day workshop is for you. Guided examples from classic routines and quick-fire exercises will teach you to recognize the funny stuff, whether it’s in the characters, relationships or entire worlds. You’ll learn how to develop your peeves into characters, and how to turn characters into hilarious situations, plus you’ll get a taste of a ‘writer’s room’ atmosphere. Rubber chickens welcome! There’s a reason many authors argue that writing the short story is much more difficult than writing a novel. Characters still need to be fully realized, often with back stories; the setting of the story needs to be exact: there is still a landscape and weather and all the ordinary objects that make a place seem real; and something significant has to occur, no matter how silently or internally. Learn how to weave into a short amount of space all the key fictional elements that make a world feel real. WriterHouse is a 501(c)3 nonprofit organization and is partially supported by the Virginia Commission for the Arts and the National Endowment for the Arts.